‘The energy from the audience gives us energy, it’s like a feedback loop’ – we had a chat to William from Future Islands. Ahead of their first headline tour of Australia since 2012 and their first appearance here since blowing away Laneway earlier this year and Splendour In The Grass the year before that, Baltimore, MD trio Future Islands are one of the most visceral, heart-rendingly emotional and above all else entertaining acts both live and on record. Seriously, you haven’t experienced anything like a live Future Islands show, believe me. We had the absolute privilege of getting to have a pre-tour chat with bassist, guitarist and the man who really anchors the sound of Future Islands, William Cashion. How’s it going William, where in the world do we find you at the moment? I’m good, I’m good. I’m just in Baltimore right now. It’s a rainy evening here. Yeah, but it’s starting to feel like Fall here which is nice. I can imagine. Just wanted to say thank you for everything you guys have done musically. Like a lot of other fans it was Singles that first put me on to you, but being able to backtrack through your entire discography there are so many songs and moments on your albums that have helped me through some really tough times, so thank you! To that end, I guess the whole appeal of Future Islands is in the really raw emotion and feeling of it all. Given that you play your songs over and over again, do you find they still conjure up the same feelings as they did when you first played them or have these changed at all? Yeah I think it’s important and you have to remind yourself that there are a lot of people there in the audience for whom it might be their first time hearing a particular song so you have to try and remember and to play it as though it’s the first time you’ve ever played it live. To remember it’s that same spirit from when it was first written. I know that Sam (Herring, vocals) writes a lot of our songs and so he’ll definitely tap into the feelings that he had when he first wrote a certain lyric at a certain point. Seeing the crowd react and respond and, you know, smile or cry or laugh along with our songs is always exciting and I feel like the energy from them gives us energy and so it’s kind of a feedback loop. It’s a relationship that goes back and forth with our audience. Definitely. With your frontman Sam tapping into those feelings it really translates into his voice and he’s well known not just for his dance moves but also for being able to change the pitch, the tone, the volume and just about anything else with his voice on a dime. Do you and Gerrit (Welmers, synthesisers) find it’s particularly hard work trying to keep up with him and be cohesive playing live? I guess with the bass guitar and also with the live drums, we’ll do things that will kind of accentuate the way that Sam is singing or what he’s singing about just in different effects or how hard we’re playing. Maybe Mike will play a drum fill of some kind. We’ll just try and do little flourishes that will kind of add to what Sam is doing. Me, Sam and Gerrit have been writing songs together for about 13 years now and we’ve been performing them live for just about as long so we just kind of have a chemistry when we perform live that we’ve been working on and just the way that we approach it and the way that we perform it has mostly stayed the same over that time but I think we’ve gotten a lot better about it. There’s also knowing when Sam’s going to fling the mic cable over and when I need to turn my back to him so that it doesn’t hit my bass or to lift my leg up so that he doesn’t knock the pedals over. It’s just about an occupational hazard working with him, I’m sure. Just touching on the length of time you’ve been working on this, we see a lot of bands who find their rise to stardom kind of an incremental progress with a record and a tour and another record and it’s a slow build. You have other bands who release one record or song and blow up from the word go. It was interesting with Future Islands because you guys plugged away for so many years and then all of a sudden just exploded almost overnight. How did that feel for you? Did you approach it as a new start? It does kind of feel like a new beginning in a way. I guess mostly because for the longest time it was just the three of us doing everything ourselves, we were managing and booking ourselves and then back in I think the end of 2010 we finally got a booking agent and then 2013 we brought on management, so our team that we work with has just grown a lot bigger. The size of the shows and the kind of shows we’ve then been able to play has just grown. Like you said, we had been growing for a long time but it was like this slow, almost organic growth. And then once we got on 4AD which was kind of a dream label for us, we all grew up listening to 4AD bands and just the way that they were able to get our music out there. They were the ones who orchestrated getting us on national television like Letterman and Jimmy Kimmel and also Jools Holland in the UK. It’s just been crazy and it’s exciting for us that so many people are able to then find more of our music through starting with stuff like Singles and through Seasons. I think that a whole lot more people are starting to dive back through our music and check out some of the other stuff we’ve done over the years which is really nice. It’s really amazing going back through and finding all these gems from your past. Even not just with Future Islands stuff but with your various side projects that you have. I know Sam has a budding rap career and you and if I’m not mistaken I read online that you and he are in a reggae band called Snails? Yeah I feel like I jokingly refer to it as a reggae band, I wish it was a reggae band. I tell people that we sound like a 1980s band trying to sound like a 1950s band. We have some songs that kind of have an oldies feel you know doo wop and stuff. We have a saxophone and keyboards and it’s kind of more of a classic rock and roll kind of vibe I think. At times we’re kind of Kraut rock. We’re actually working on finishing up the Snails album, I just worked on it today with the producer and we’re hoping to finish up the full length for Snails and have it out soon. Very nice. Do you find yourselves taking stuff from Future Islands and adding it to these side projects and vice-versa? Or is there complete separation? I mean there’s definitely things that I’ve done in Future Islands that definitely inform decisions that I make musically in Peals and Snails the two side projects I’m in. As far as ideas I have I probably wouldn’t take anything from Future Islands to another band, that kind of thing doesn’t happen. Is that what you meant? Kind of, I guess more so just little influences in each of those bands sort of creeping and overlapping their way across them? I definitely have a similar approach to the bass when I play in Snails as I do when I play in Future Islands, yeah. Looking forward to hearing it. So you’re coming out to Australia in the next few weeks. The last time you were here was for Laneway earlier this year and then at Splendour the year before which was an absolute highlight for me. A lot of your fans here have really only experienced you guys in a massive festival environment, so what can we expect when the venues shrink and it then becomes your own show that we’re watching? I guess the main thing is that we’ll be playing longer sets and that’s really exciting for us, because when we go outside of a festival and get to play our own headline shows we get to play a big set that’s usually about an hour and fifteen or an hour and twenty minutes. We get to dig and dig and pull out some songs that we haven’t played for a while which we enjoy. At festivals we tend to try to keep it upbeat and if we do play any slow songs we try to keep it to one but with a live show when it’s our own headline show we have a little bit more of an ebb and flow to how we put the songs together in the set. We’ll slow it down and we’ll keep it slow for a minute and then we’ll bring it back up. We try to go back and forth with the dynamics of the vibe of the show I guess. It’s not only your own headline tour that you’re coming in for but you’re also splitting time at the Gentleman Of The Road shows in Sydney and Melbourne with people like Mumford And Sons, The Vaccines, Jake Bugg and a few others playing. Have you had the chance to meet anyone on the bill yet or will it be a whole lot of new introductions? We got to meet some of the Mumford And Sons guys this past summer when we played a bunch of festivals with them. Everyone we met from them was super sweet, either a part of the crew or dudes from the band, they were all great. Their live show is amazing, we got to check them out when we played with them in Spain and it was just surreal like the sea of people and everyone knowing the words and yeah, I’m really excited to see it in Australia. You guys have been really quite kind to your fans down here in Australia and you’ve never really left us hanging for too long between shows. Is there anything in particular you like about coming Down Under? I think you guys just have a vibe. I feel like Australians are just really chill and awesome people. We’ve always had a great time down there and I think it’s because you guys have this killer beach culture down there, I love the beach. The first time I ever tried surfing was in Byron Bay when we were there for Splendour. It was the first time I’ve tried. Also you guys are lucky because it’s so easy there to find organic, fresh juices and smoothies and you guys are pretty vegetarian-friendly. Most of the places I’ve been in Australia I can find healthy options whereas a lot of other countries I’ve been to it’s harder. It may not seem like a big thing but to me that’s always stood out. I try and drink as much green juice as I can when I’m on the road. Good tip for keeping you going on the road. We haven’t really had any new material from you guys since The Chase and Haunted By You earlier in the year. Just wanted to know if that was a taste of the follow-up you guys might be working on to Singles or was that just a one off? Yeah so we had February off this year and we just took that time to write a couple of new songs. So we came out with The Chase and with Haunted By You. We have a couple of other ideas from those sessions that at this point are just kind of laying there untouched but we’re definitely going to revisit some of the songs that we started working on during those sessions. Kind of just a one off though, we wrote them in February, recorded them in March and then in late April we released them. That was the quickest we’ve ever done a standalone single. We try to always release at least a song or a group of songs on a 7 inch if we can in between albums to keep it moving and keep it interesting and it’s kind of fun. As a music fan I always enjoy those kind of oddball songs that fit in between the cracks. This one was the most exciting for sure though. We recorded it in that short space and then we debuted it playing the second time on Letterman when we did the live debut of that song and then that same night at midnight was when it came out, so it was definitely the most exciting rollout for a new single that we’ve ever done. Can’t wait for the next one. 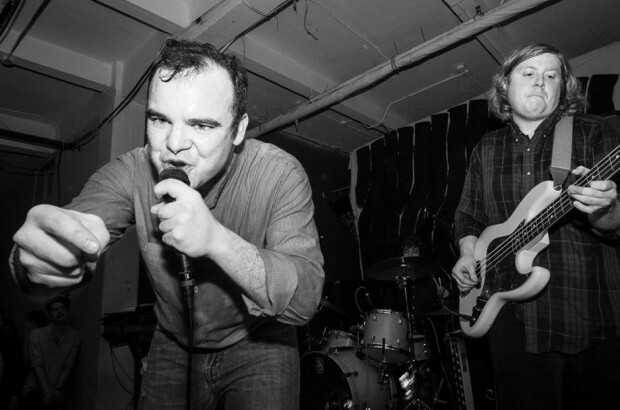 Just to wrap it up, what can we expect from Future Islands in the next 12 months? We’re definitely going to be redirecting all of our focus on writing and recording right after we finish up this tour of Australia and I guess that’ll probably take up most of the next 12 months, but hopefully we’ll have something for you guys by the end of those 12 months. I’ll hold you to that. William thank you so much for the chat here today, we’re looking forward to seeing you and the rest of Future Islands coming out to Australia real soon! Cool, thanks so much. We’ll see you soon! Future Islands are touring Australia and playing these dates!